Poppy (left) and Daisy (right) sit on their stuffed tabby cat faux-mom while their real mom is lapping up lunch in quick mouthfuls. Shot with my handy-dandy iPhone 3G, which I LOVE, but not in a sick, perverse way. 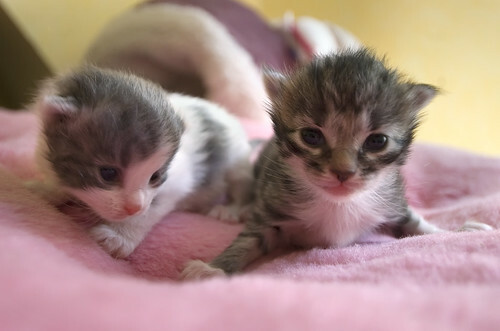 Oh, and the kittens are 24 days old today! A year and a half ago, I trapped, neutered and released three feral cats. Their full story is in Chapter 6 (see post below). I'm sad to say that it's been 3 months since I last saw one of the ferals: Madison. I thought she, of all of the ferals, had the best chance to become socialized. Perhaps it was her good nature that helped her find a true home with one of my neighbors, but I find it unlikely. I think Madison died—possibly killed by a wild animal or a car strike. She was only two years old. She was a sweet cat. I could tell from the first day. Even though she was feral, she liked to play with toys and the fact that she would allow me to pet her was a gift of her trust. I saw her every day for more than a year. When she stopped coming by I didn't worry right away since the weather was warm and she could hunt for food, if needed. I never stopped putting out food, even though many times I found it uneaten. I began to worry that not only did Madison die, but her Mother, Bronte and our rascally neighborhood stud (well, not a stud any more!) Buddy, too. They just disappeared. After the first month absence, I began to see Bronte and Buddy once in awhile. I saw a new cat, too, a mangy red male with an ear deformed from fighting. Did he scare Madison off? But then even he was only seen for a week or so, then vanished, too. All that was left was Bronte and Buddy. I call Madison's name every morning when I put out the food, hoping she'll return to me, but every afternoon when I check it, I often find the bowl untouched. It breaks my heart, but I knew that this was the best I could do for them. This was what I could offer because I don't have the facility to foster cats for long periods, when I could be helping 50 or more kittens in the same span of time. They never deserved to live like this in the first place. 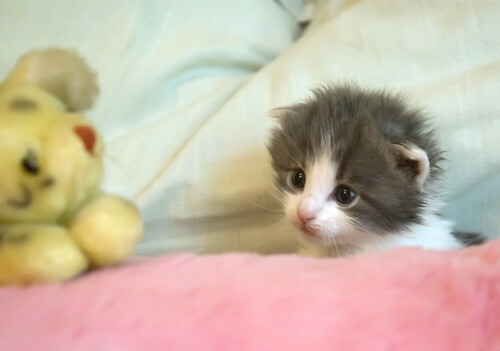 All we rescuers seem to do is try to make up for the cruel acts of other people. Some times we have success and other times, it's like today-our hearts sink and our knees feel weak, imagining what has come to pass. It's tough to keep facing this ugliness, but we must, for their sake, and for the hope that one day, we won't have to do this any more. That all cats will have good, loving, responsible owners and that all of us that do rescue can focus on other things to help this world be a better place. Read more about Day 11. Super Cuties! Just 9 days old. Eyes still closed. Little Poppy lets me grab a photo before placing her back into her Mother's watchful care. Spotlight, is a 10 year old, FIV positive kitty. His owner, Kristen, is having a lot of trouble helping Spotlight to overcome high fevers and potential pancreatitis flare ups. Spotlight is in the hospital as I write this. I'd be very glad to know you're all sending him your best wishes for his speedy recovery. Kristen needs some love, too, so let's post some comments to cheer her up! Spotlight, please get better! We're all rooting for you! Update: 8.10.08: Spotlight came home tonight and is doing somewhat better. Keep your fingers and toes crossed for this sweet boy! More updates, as they come in. Meet Rose and her little babies. Born 8.1.08. One boy and one girl. It's been four months. The height of Kitten Season came and went without me helping even one kitten find a new home. It was important for me to look after Bob and to make sure to reduce any risks to his health, until he was, at least, stable. Bob's been doing fairly well. He still vomits, but it's rare and I've only had to medicate him once in two months and NO Vet visits in all that time! Thank goodness. Bob's coat, appetite and demeanor have improved. He seems youthful, in some ways. I actually got him to RUN after a toy just yesterday! Bob's also integrated himself in with my cats in ways I could not have hoped for. I keep finding him snuggled up with Nora or her brother, Nicky. I think Bob would sleep with all of the cats if they'd only allow it! In a week, it will be two years since my Mother died and Bob came to live here. I was going to find a good home for him, as the idea of having seven cats was not something I wanted to entertain. Now, I can't imagine him being anywhere else. He is a charming cat with a bubbly personality. He has the goofiest purr and his motor runs most of the time! This morning I have to prepare the foster room for new arrivals! At 2pm a young tuxedo Mom-cat and her two newborn kittens will be joining us. 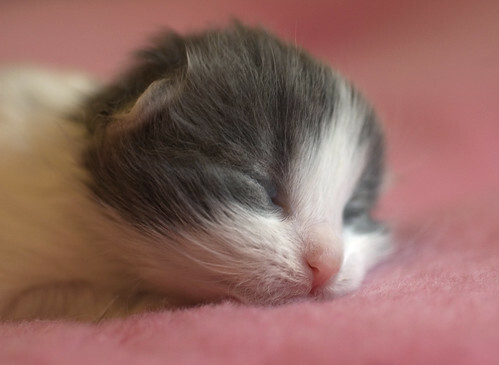 The kittens were born last Friday, August 1, 2008. They'll need names, so I'll post photos of them and we can have a little contest. It'll be good to have new life here and good timing for it to happen. They will keep my blues at bay. This is a difficult time of year for me and fostering kittens is like opening the blinds to let the sunshine fill the room. I woke up this morning, early. I have a client meeting to get ready for. I showered, dressed, slapped on maked-up, then made my way downstairs to prepare the morning meal for my cats. I grabbed a few cans of cat food and blended them together, then microwaved the mush to add a nice, appetizing aroma to their breakfast. I divided up the bowl of food onto smaller plates, then began serving them. I feed the cats in order and they each have their own place to eat. This keeps everyone calm and avoids fights. As long as I'm consistent, they follow suit. I begin with Spencer and Bob because they'll trip me if I don't feed them first. Nicky gives me a froggy-meow as I place the food before him and his baby-seal-like 22 lb sister, Nora. Just another morning in the woods. Just another day. No big deal. The next two to be fed are Gracie and her daughter, Petunia. I began to place their food down when I noticed something wrong. Before I could utter a scream, I realized there was a dead field mouse next to Gracie's plate. Resigned to the fact that my cats are going to do this from time to time, I simply put Gracie's food down, fed the remaining cat, Cricket, then picked up my camera. How Gracie can be so blase about eating breakfast next to a dead mouse is beyond my understanding. I felt badly for the poor mouse, laying there so still, as though he was a discarded leftover, to be ignored and unimportant forever more. The little mouse is now in the lap of my Buddha garden statue, out in the front yard where his remains may benefit other beings who need him to live. Meanwhile, Gracie is going to get de-wormed! Geez, time flies. Seems like just yesterday I was complaining about hunting down cat urine markings and now look it's almost August! Yeah, call me a slacker, but I have a good excuse for not posting over these past few weeks. No. It wasn't Bob. Bob is doing well. He's basically stable and if he vomits, I have fairly reliable ways to manage the problem until it subsides. Bob's due for some updated tests, but it's been almost 6 weeks without a Vet visit, so why look for trouble? So what was Bob's final diagnosis? Who knows. All I know is I'm out $6800.00! My life with cats has been on the back burner. I've been at my Mother's house every day for the past month, cleaning it out, preparing and having an Estate (bomb!) sale and then doing the final clean out before the new owners move in. In this lousy housing market, Mum's house sold in a few DAYS. The owner's wanted to take possession quickly, so I had to move fast to make their deadline. Of course, where is my brother? He is suppose to help me? No. He is busy, as usual. Now he is on vacation in Australia. Before that he was in San Francisco, Chicago, Paris, India! Uh huh. Thanks brother. I could have and did do it without you. Who cares that the temps were in the 90's, humid, no A/C and the mold, dust and mildew I snorted was enough to shorten my life span. I'm lucky I have some very good friends. They pitched in, coming to help after they got out of work each evening, schlepping over folding tables and helping me price about 50 Hallmark Holiday Ornaments, which, did not sell! My good friends even bought me dinner or took a day off to be there with me during the hours of the Estate Sale. That, my friend, IS a good friend. So thank you to them and they know who they are! 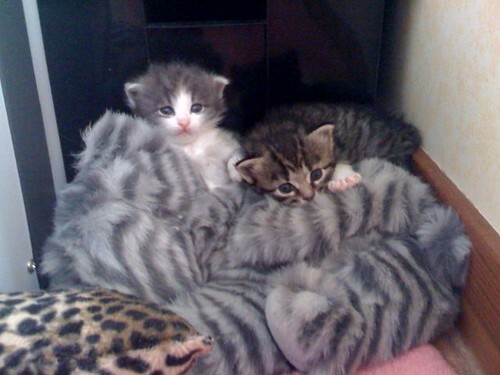 I haven't been able to resume fostering kittens. It's been four months without the sound of romping, under 10 pound cat sounds. I miss it. Now that the house is sold and I'm in the final stretch of getting the Estate through Probate, I can make the call to Monica, to get me some nice little furballs and get back in the game. Sadly, I hear that adoptions are DOWN. A factor of the economy, no doubt. The kittens we have gotten in have been more skittish than normal. It's been a bad year for our rescue group and I'm sure the same can be said for many other groups, as well. Com'on folks! Get out there and adopt a homeless cat! Read more about So, where was I?